for the U.S.A, the UK., Canada, Australia and New Zealand. You can file for divorce by using the Divorce Forms and information presented in this article. In all four countries mentioned, you are not required to involve a divorce lawyer or a sollicitor. Instead, you can file for a divorce yourself and reduce the costs of the procedure. However, it could be wise to hire a divorce lawyer is you are not confident to do it without. Without the involvement of a lawyer, you might miss some important topics. That can be very costly or emotionally difficult afterwards. For complex issues, you could consider to consult a divorce lawyer. To divorce in the U.S., you are not required to involve a divorce lawyer. You can prepare and file for divorce yourself. But, again, we recommend you to involve a divorce lawyer when your case includes complex issues. Some states present the forms as downloadable packets, including extended instructions how to fill them in. A few states do not provide divorce Do-It-Yourself forms on their web site. For a straightforward no-fault divorce without children, in most of the states it is not very difficult to fill in the forms and to file them at the appropriate court. There are many forms on the Internet available, that allow you prepare all the paperwork yourself. DIY will save you the high costs of a lawyer. These web sites offer downloadable forms for many purposes, also for Divorce. US Divorce Papers offers versions for Divorce with Children and divorce without children. Their proven divorce forms can be found on the web site of USDivorcePapers.com. You can chose the forms for your state. The service gives you also all the information you need to fill out the forms. The divorce form kit guides you step-by-step through the process. Filing your divorce is made easy. The forms and the guides are kept up-to-date by attorneys. Download your forms to divorce for the U.S.A. here: USDivorcePapers.com. Note: Based on 12 user reviews, the Divorce Forms above average a rating of 4.5 out of 5. In the table below you can find the links to the Divorce Forms of your province. In any case, consult a lawyer for legal advice. If you and your partner prefer to go through mediation, you could still consult 1 lawyer together to guide you through the legal paper work. The lawyer can take the nasty work out of your hand, he prevents you and your partner from making (expensive) mistakes and he knows the do's, the don'ts. He is able make the duration of the legal process as short as possible. 3. Get your Canadian Pension Plan Credit splitted. In England and Wales, there is no need to involve a solicitor to divorce. You can take care of that yourself. Especially if both partners agree on the divorce and on the terms of the divorce, it will save you a lot of money and hassle. If you cannot agree on the terms of the divorce, the next best approach is to hire a divorce mediator. If you want to know more about mediation in divorce case: Mediation. The forms are free, but there are some court charges: \A3340 (2011) to start the divorce or dissolution process. You have to pay\A345 for the decree absolute or the final order. Please note that you may qualify for a total or partial free remission. Please check the online explanatory leaflet from the court. Next, find a family law court near your home or work. In fact, you can choose any family law court in England or in Wales. Courts in smaller towns tend to be less busy and they go through the process faster than the courts in the cities. A list can be found on the Court Service Website Court Information and Addresses section. For ending a civil partnership, only a limited number courts are authorised. To safeguard your finances, the cheapest and fastes way to go is to hire a solicitor make a clean break consent order. Next, complete a 2-page financial information form and send the consent order to the court. The court will charge you the fee of \A340. If you do not feel confident enough to go through the process yourself, or if it is too stressful for you, you can of course call in the services of a solicitor. But again, it is not required to do so. In Australia you can apply for divorce yourself or you call in the services of a lawyer. Furthermore, you need to prove that you and your spouse lived seperated during at least 12 month before filing the divorce and that is is unlikely that you both will get back together again. If you have children under the age of 18, a court will grant a divorce only if it is satisfied with the arrangements have been made for your children. You must file an application for divorce with the court. A fee is required. The Family Court of New Zealand deals with a lot of issues regarding child care. Please remember. Divorce is called "legally dissolving a marriage" in New Zealands legal texts. The process is slightly different from those in other countries. New Zealand law recognizes one ground for divorce only: "Irreconcilable differences". This means, the relationship is broken down and has come to an end. Hence, divorces are "no-fault" in New Zealand. You have to prove the irreconcilability by living separated for at least 2 years. It is not possible to shorten this period, even if you and your partner fully agree to dissolve the marriage. To be able to prove the separation, a separation agreement or a separation order from the court is not strictly necessary, but it is recommendable. If your partner does not sign a separation agreement, you can go to the court to ask for a separation order instead. Only one of you or both of you can file an application for dissolving your marriage. One of you or both must be domiciled in New Zealand. You are only required to appear in court when the other party opposes the application. Thank you! You have successfully subscribed to our Program. Check your email to confirm, please. 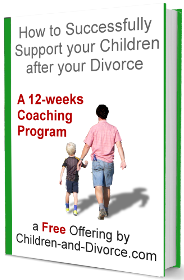 By signing up, you will receive each week insights, ideas, tools, tips and exercises how to create a positive mindset and a stimulating environment in which you and your children will thrive after your divorce. The program is offered to you in 12 digestable parts.